Email is always an effective strategy for capturing attention, it is actually a very reliable method for encouraging people to donate online. Consider for example how often you have received an email that has helped you remember that you wanted to participate in something. Sending emails for an online fundraising campaign has a similar impact, and it also enables you to clearly get the point across about exactly why you are trying to raise money online. 1.) Emails can convince potential donors to move forward with their plans to donate online. 2.) Emails can keep supporters up to date on the entire process of your online fundraising campaign, and this will encourage them to make additional donations throughout the process. 3.) Emails can easily be forwarded by your supporters, and this will help your cause find a much bigger audience. Whether you are learning how to fundraise or you have a long history of backing good causes, it is always a good idea to utilize every possible technique that is available to you. Even if you do not use your email a lot during your daily life, it is important to recognize that a lot of people do. Therefore, you need to embrace the idea of sending emails if you want to have a fully funded campaign. In fact, failing to send out emails is the number one mistake that people involved with fundraisers make. Even if you truly believe that email will not capture a lot of support for your fundraiser, we challenge you to give it a try so that you can see just how useful a more personal form of communication can actually be. The following 16 tips will help you get the most out of your emails. By following these steps, you are virtually guaranteed to increase the amount of donations that your fundraiser receives. 1.) You need to take steps to organize your email list by several different categories. Doing this will enable you to send out messages that will have the best possible results. There are four vital steps to undertake to ensure that your email list is properly organized. a.) 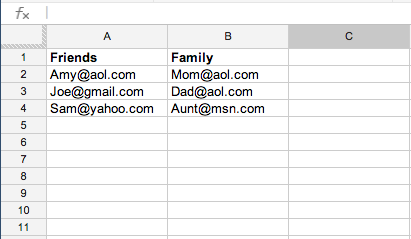 The first step is to gather every email address that you have and place it into an Excel spreadsheet. Consider for example how much easier it is to send out party invitations when you have everyone’s addresses located in one address book. The same basic idea applies with emails, but you should utilize a spreadsheet instead of a book. I suggest using Google Docs. Their excel sheets are free! b.) Create separate areas within your spreadsheet for family members and friends because you will treat both groups differently. For example, if you are asking a family member to donate, you can invoke a family memory that will capture their attention. c.) It is important to make a distinction for different time zones as well. Consider how much more likely you are to read and respond to an email that comes in while you are awake. Because of this, you need to know which of your potential donors live in different time zones. d.) As soon as all of your email addresses have been organized, you can copy and paste them all into the DonationTo.com email system. Doing this will save you a lot of time and it will ensure that all of the email addresses are retained. After all, anytime you type out a long list by hand, it is easy to miss something. 2.) Some people think that sending one email is good enough, but this will only let you capture the minimum amount of support. Consider how often it takes a few different emails for you to take action on someone else’s fundraiser or even to pay your annual dues to a group that you belong to. Most of the people who receive emails about your fundraising ideas will have the same level of responsiveness that you typically do, and that means that it is vital to send out multiple emails. Instead of sending out several in a week and annoying people, though, you should follow a timed approach. To make sure that you stick to a schedule, it is a good idea to type it out in advance into an Excel document. The following six steps provide a good example of how you can schedule your email strategy. a.) Week One – In the first email, it is important to introduce your fundraising ideas and to provide a basic synopsis of what you hope to accomplish. Keep the email relatively short, though, as no one enjoys reading through a lot of text online. Make sure that you include a link to the online fundraiser, and encourage people to ask you about any questions that they have. b.) Week Two – In the second email, you should provide supporters and potential supporters with an update about how much money was raised during the first week. It is usually best from a psychological standpoint to represent this data with a percentage instead of a dollar amount, so if you raised $500 of a $2,000 goal, you should let people know that you have already collected 25 percent of the necessary funds. Take this opportunity to also remind people about where they can donate. c.) Week Three – Building awareness is very important, so ask all of your supporters to go to your DonationTo.com fundraiser page and click the Facebook like button. Make sure that you provide the link in your email to make this process as simple as possible. d.) Week Four – Ask all of your supporters to send out a tweet on Twitter to support your cause. Include the link again to your DonationTo.com page and consider supplying a sample tweet that people can use. e.) Week Five – Utilize week five to provide a new update on the total percentage of your goal that has been raised, and make sure to thank any major donors. f.) Week Six – Create an email that explains all of the basics of your fundraiser and ask all of your supporters to forward it to at least one of their friends. Many fundraisers will last for longer than six weeks, but you can simply continue with the same formula every six weeks. It is also a good idea to ask people to donate their Facebook status for a day to spread the word about your fundraiser. By involving your supporters throughout the entire process, it will be much easier to raise money online. We always suggest marking this down in some organizational tool like excel sheets. This will keep you on track with what emails you have sent, what needs to be sent — basically an email schedule roadmap. 3.) The method that you choose to send out emails will have a big impact on how easy the entire process is. The following four tips will enable you to streamline the entire process so that you can focus on the fundraiser itself. a.) Email providers such as Gmail and Yahoo will enable you to reach out to your family and friends, but they will also have a limit of how many people you can email at one time. Consider how cumbersome it would be if you had to split thousands of emails into chunks of 25 or 50 people. This would take up a lot of time, and it might keep you from getting the message out to everyone. Instead, you should consider investing in new email technology. b.) DonationTo.com does offer an email system, but you can also utilize MadMimi.com and MailChimp to send out a large quantity of emails at once. c.) DonationTo.com enables users to send out emails quickly and simply, so we are the perfect choice if you are most concerned about quick execution. However, MailChimp and MadMimi offer a wide range of different options that some users will prefer. d.) If you end up sticking with your email provider, make sure that you never use the CC feature when you are sending out a mass email. Consider how unhappy you would be if someone exposed your email address to a large group of people who you do not know. Your potential donors will feel the same way, and sending out emails that do not follow this guideline will result in less donations. Instead, you can put your own email address in the to line and put everyone else’s in the BCC section. 4.) Understanding the Elements of an Email – Although it might seem simplistic, it is very important to properly understand how each element of an email will help you capture attention. For example, if you leave the subject line blank or just write the word “hello,” most people are going to believe that the email is spam. The following list examines the two main components of each email, and it will also help you ensure that your fundraising messages are properly formatted to achieve the highest possible amount of readers. a.) Know the Different Parts of Your Email – Every email has a subject line and a body. The subject line is what people first see when they look at their list of new emails, and the body is the area that will contain your actual message. The body of your email is where you will convince your readers to take action. For example, an enticing title will get the reader to open the email, but without a compelling narrative within the email, no one is going to take any definitive action. Therefore, you must utilize the body of your email to present enough information to convince readers to donate to your cause. Remember, though, that most people will not take the time to read an extremely long email. Therefore, it is best to introduce your fundraiser and then provide bullet points before you wrap up with a quick summary. It is also imperative to always include a direct link to your DonationTo.com online fundraising page. By doing this, you can capture the attention of your readers and encourage them to learn more by visiting the fundraiser. As soon as you can get them to click that link, your odds of receiving a donation go way up. 5.) The most important aspect of crafting a successful subject line is to make sure that it is short and to the point. After all, long subject lines will get cut off by most email providers anyway. Consider the negative impact that your email could have if the subject line gets cut in half before the actual point is revealed. When you stick to subject lines that are eight words or less, you can remove this potential issue and ensure that everyone will be able to see exactly what you are trying to say. Keep in mind that most of the people who will be opening the email are your family and friends. Because of this, it is vital to have the from line of the email contain your name. That way, when your supporters receive an email, they will see your name next to the subject line. For example, if your name is Jason Smith and you are hosting a fundraiser for a marathon, your friends could see the following in their inbox: “From: Jason Smith. Subject: Help me Raise Money for a Marathon!” Seeing your name next to an enticing subject line should be enough to get everyone to click on the email to learn more. Your subject line should always give people information about what you are asking for. That way, people will instantly feel a connection to the process, and if they absolutely do not have the money to participate, they can choose not to read any further. For most people, though, the opportunity to help a friend or family member with a worthy cause will be met with enthusiasm. After all, we are often asked for donations from people we have never met, but it always feels much more comfortable to keep our money close to home. a.) Fundraiser for My Marathon! b.) Running to Raise Money for Cancer Research! c.) Donations for My Next Marathon! d.) Support Me as I Run for Cancer Research! As you can see, each of the examples above are short and to the point, but they will definitely capture attention when they show up next to your name in everyone’s inbox. 6.) As a reminder, the only purpose of the body of your email is to get people to take action. This is why other fundraisers utilize this section to explain what the fundraiser is for and provide a link to the fundraising page, and this is exactly what you should do with your emails too. However, it is important to understand the best way to construct the body of an email so that people actually click the included link instead of hitting the delete button. Getting someone to pay attention to your emails means that you must write in a way that is both eye catching and to the point. The following list explains some of the key points of constructing a successful fundraiser email. Although this section will only provide an overview of each of these key components, we will expand upon every step in email fundraising tips seven through 12. a.) Whenever possible, you should greet the reader by their first name. 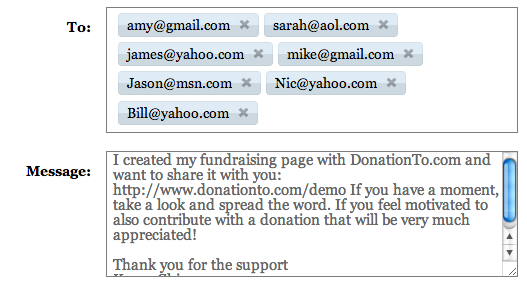 Doing this will capture their attention and it will make them feel instantly more connected to your fundraiser. b.) Include a relevant introduction so that the reader knows that you really know them. For example, if you are sending a message to a man named Bob who you saw at a party last week, you could begin the email by saying “Hi Bob, it was great to see you at Sarah’s birthday party last week!” This type of introduction will break the ice, and it will also make the reader feel more comfortable before they delve into the rest of your message. d.) When you are asking someone to donate to your cause, it is always a good idea to offer them something unrelated in return. For example, if you are sending a message to a man named Bob who you are going fishing with next week, you could include a sentence to let him know how much you are looking forward to your outing and to remind him that you will be bringing an extra fishing pole for him. e.) You should provide a close that is just as relevant as the opening of your email. In other words, acknowledge the reader by name again, and consider including something else that will personally connect them to you such as a joke that the two of you share. f.) People want to know exactly who they are dealing with, so you should include a signature line that has your full name, company name and any applicable URLs. By doing this, people will feel more confident about supporting your fundraiser, and your emails will also have a more professional touch. Now that you have learned a bit about each of the parts of an email body, it is time to take a closer look at each individual element. 7.) If you want the reader to develop an instant connection to your cause, you will need to greet them in a personal manner. For example, consider how much more likely you are to respond to an email that starts off with your name instead of a standard phrase such as “Dear Sir.” The fact is that everyone feels a personal connection to their own name, so it is in your best interests to use this to your advantage if you want people to become instantly more interested in the rest of your message. If you fail to address the person by name, they will probably fail to take your fundraiser seriously. After all, most people want to feel like they are being personally acknowledged, especially when a request for money is involved, and if you fail to provide this, they will probably feel more like you are looking at them as a source of easy money instead of as an individual person. The advantage of providing a relevant introduction is that it instantly breaks the ice and breaks down the reader’s level of skepticism. After all, anyone can send an email asking for money that includes your name, but this does not mean that the email is actually from you. Therefore, it is always a good idea to build trust at the beginning of the email by acknowledging your personal relationship with the reader. Once you have built this level of trust, the reader will feel much more inclined to make a donation to your cause. The example listed above will work well because it is short and to the point, but it also gives the reader an incentive to help out. After all, most people will view it as noble that you are attempting to raise money for charity by running in a marathon, and that will make them feel good about supporting your efforts by making an online donation. The best thing about using only a short blurb in a fundraiser email is that it ensures that the reader understands what you need without making them feel like you forced them to spend an exorbitant amount of time reading a long winded email. 10.) Everyone likes to feel like they are associating with a good person, and people also enjoy the feeling of receiving something in return for their charitable efforts. Therefore, you should include a personal blurb that references something that you can provide for the reader. For example, if you happen to make cookies that the reader really loves, you could mention bringing them a batch the next time you are in their area. This will give them another reason to feel personally connected to the email, and it will also make them feel like you appreciate the fact that they are considering making a donation. Make sure that you include something relevant in the giving back section, though. After all, if you offer something that the person has absolutely no interest in, it might actually make them feel less connected to your fundraiser. The ultimate goal is to get people to donate, so take every step possible to ensure that the reader will get to the end of your message and decide that they feel good about supporting your fundraiser. Regardless of what you say, though, the most important aspect of the relevant close is to make the reader feel good about their association with you. After all, if they conclude the email with a good feeling, they are much more likely to make a donation. This is the main reason that you do not want to end the email after making your request for a donation. Make sure you do not include a relevant close that is extremely long, though, or you might cause them to forget about the point of your entire email. 12.) Some readers might still be a bit confused about exactly who you are at the end of the email, especially if they have only met you once or twice. To ensure that everyone has the opportunity to connect all of the dots, you should include your full name, company name and any applicable URLs at the end of your email. Another good reason to include an authentic signature is that it will provide potential donors with an easy way to contact you if they have any questions about your fundraiser. The signature line will also provide a more professional conclusion to your email, and this will make it look like you are taking your fundraiser seriously. Consider for a moment how you have felt in the past when someone sent you an email asking for assistance that only contained their first name and perhaps an emoticon at the end. Although this works for casual correspondence, it is better to avoid a signature line that is simplistic for your fundraising emails. Even though the body of your email will most likely contain language that is casual, it is still a good idea to conclude the message with an authentic signature. 13.) Now that you have a firm grasp of how to construct each part of the body of the email, it should be easy to write one that will make people feel personally acknowledged and interested in your fundraiser. Always consider the impact that each sentence of your email will have on your readers, and make sure that you keep things short but friendly. The email listed below provides a good example of how to do this, and it is a template that you can utilize when you decide to reach out to potential donors who you know on a personal basis. It was really great to see you while I was in New York City last week! I am planning to return to that area in June, and it would be awesome if we could get together for dinner. By the way, I will be running marathons for the next few months to raise $10,000 for charity by next fall. My fundraising page is located at www.DonationTo.com/myMarathon, and I would love to get your support. Please consider contributing to my cause today to help me reach my goal in the coming months. I know that you enjoyed those cookies that we shared for dessert last week, so the next time I am in NYC, I will make sure to bring you a fresh batch! I saw that NYC was hit by 5 inches of snow last night. Try to stay warm! Now that you have constructed an email that contains all of the key components, it is time to put together the remaining elements of your email strategy. 14.) There are many different theories about the best time to send an email, so it will be important to consider the following list and to experiment by sending your messages out at different times. After all, even if most people in the world respond to emails at a specific time, your list of contacts might respond differently. Therefore, you should try all of the steps listed below and then continue to implement the steps that provide you with good results. a.) Although you might feel tempted to send out your emails at the beginning of the week so that you remember to get them out, it is important to consider the schedule of your recipients. If the majority of them work in an office, they will probably be much busier on Monday and Tuesday than they will be on any other day of the week. b.) Sending out an email early in the morning might capture attention from people who have smartphones, but your message will most likely be forgotten before readers have a chance to take any action. After all, most people head into work in the early morning hours, and this means that they are unlikely to be able to take the time to make an online donation. c.) Another time to avoid is between 5:00 p.m. and 7:00 p.m. because this is when most people are driving home and eating dinner. Again, people with a smartphone will probably see your message, but if they are unable to immediately respond, they are likely to forget all about it. Although it is a good idea for you to experiment to discover when your readers are the most responsive, you can get some additional tips on timing by reviewing this infographic. d.) Keep in mind that some people live in different time zones, and this will have an impact on when they will be the most likely to read your message. This is the main reason that you should organize your email list by time zones. Ultimately, you will need to track the results of each email to determine when you should send future messages. For example, you might discover that your core group of friends makes the most donations when an email is sent out between 2:00 p.m. and 3:00 p.m., and this data should trump any of the suggestions that are given by other people who organize email campaigns. a.) Which group are you sending a specific email to? By tracking this data, you can learn if certain groups are more or less responsive to a specific approach. b.) What is the title of the email? If you discover that a specific type of title garners a better response, you should definitely consider using the same formula for future emails. For example, you might learn that your family members respond well to subject lines that have an exclamation mark in them, and you should utilize this knowledge to capture their attention with each of your future fundraising emails. c.) What is the body of the email? Even though you should utilize the tips listed above to construct the body of your email, you will definitely find that some approaches work better than others. Track these results by making a list of the different approaches that you have tried and how many people donated after receiving each email. d.) What time did you send the email? The best way to learn what time to send emails in the future is to track the time of each email that you have sent in the past. Whichever time frame gains you the most donations should become your preferred time frame. e.) What are the exact results? Keep a list of the donations that you receive after each email. f.) How many people opened your email? Tracking this will help you learn how effective your subject line is. Make sure that you try out different subject lines to figure out the best approach. g.) How many people clicked on the link within the email? This data will teach you how effective the body of the email was. If you have a low click through rate, you should try a new approach to the body. h.) How many donations did you receive as a result of the email? This information will help you gain an overall image of how successful each aspect of the email was. The emails that receive the most donations will be sent at a good time of day, and they will also include a compelling subject line and a well thought out body. 16.) A lot of people get so excited about sending their first fundraising email that they fail to take the time to make sure that it is rendering properly. It is very important to test this, though, especially if you are using a program to help you send an email with images or other enhanced options. Consider for a moment how devastating it could be to your fundraiser if you send out an email to several hundred people that includes a bunch of dead picture links. Instead of taking this risk, you should simply send a test email that goes only to your email address. In addition to looking at the results of your test email on your computer, you should also take the time to see how it looks on both your smartphone and a tablet. Keep in mind that not all of these devices will render information in the same way. This fact provides fundraising organizers with a compelling reason to avoid sending out messages that are overly fancy, but it is still a good idea to make sure that your emails are visually appealing. Finding a happy medium does not have to be difficult, though, as long as you take the time to test your emails. It is also important to take a moment to click on any links that you have embedded into your email. After all, it would be horrible if a typo kept all of your supporters from being able to make a donation. In this case I sent the 1st test email to myself. Visually I see how it looks when users read my email. This is a great way to test emails, spot mistakes before sending them to 100 of donors. Emails are one of the most overlooked tools by most people who are putting together a fundraiser, but you can definitely utilize a strong email strategy to increase your total number of donations. It is important to make sure that you fully understand each aspect of an email, however. For example, if you fail to include an eye catching subject line, you will not get people to read your email. If you will be sending messages to people all over the world, you will need to make a list that separates your email contacts by time zone. After all, it makes no sense to send someone an email at 2:00 a.m., and it is also vital to experiment until you discover what time frame provides you with the best overall results. People like to feel personally connected to the person who is asking for money, so take the time to greet them by name at the top of the email and then include a relevant introduction and conclusion to ensure that they remember who you are. After all, most people prefer donating to someone who they know, so helping them connect your fundraiser with a good memory of time spent with you is a great way to encourage people to donate. Once you begin sending out your emails, you need to make sure that you track their results so that you can maximize your potential donations. It is also important to test your emails before you send them out so that each of your readers will receive correct information that they are able to access on their computer, smartphone or tablet. You can start crowdfunding for a campaign using email tips provided by our donation website. To crowd fund via email please refer to DonationTo.com tips.